HOUSTON -- A Harris County sheriff's sergeant was treated at the hospital after picking up a flyer on her car that tested positive for fentanyl, a deadly opioid, reports CBS affiliate KHOU. The flyers were placed on about 10 to 12 cars Tuesday afternoon parked on the street near a sheriff's office facility on Lockwood Drive in Houston, officials said. One of the flyers have so far tested positive for fentanyl, Harris County Sheriff Ed Gonzalez said. The others are being tested at a lab, KHOU reports. The sergeant left work at the facility around 1 p.m., saw the flyer on her car, picked it up and started driving, Gonzalez said. She then started feeling light-headed and having other symptoms. She was treated for possible fentanyl exposure and released from the hospital. 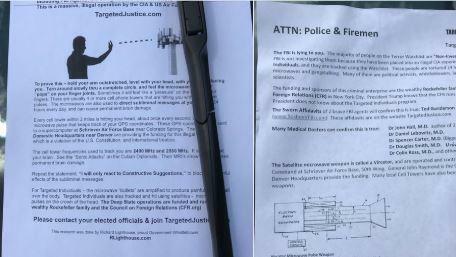 Gonzalez says the department is on "high alert" because it's not clear whether whoever placed the flyers intended to target law enforcement or whether they were placed at random. It also wasn't clear whether the flyers could have been placed in other locations. The sheriff's office released a photo of the flyer and urged anyone who sees something similar not to touch it and to call 911. Gonzalez warned the opioid is deadly and can be easily transferred. The Harris County Hazmat team is evaluating the scene at the Houston facility.